What is the Prairie on Farms Project? There is increasing interest in planting prairie on farms, for soil and water conservation as well as wildlife habitat and personal enjoyment. The Tallgrass Prairie Center works to share our knowledge of prairie reconstruction and management techniques with rural landowners and technical service providers. The Prairie on Farms Program aims to scale up the use of prairie as a reliable, durable, and multi-functional conservation practice on private agricultural land. 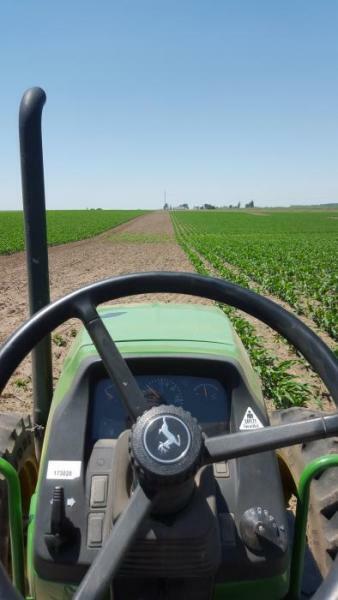 In particular, the technique of planting prairie right in the field, in strips that lie roughly on the contour (while fitting in with farming operations) has become increasingly popular. 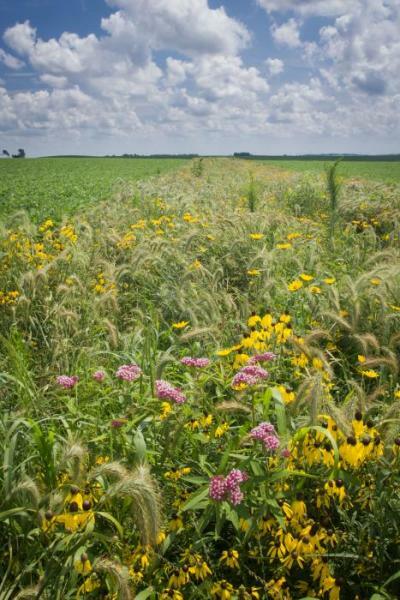 Prairie strips can stop erosion, reduce nutrient loss, improve soil quality and support monarch butterflies and other wildlife. The Prairie on Farms program has four main components: (1) The creation of demonstration sites designed for learning (2) Technology transfer through focused training such as field days, workshops and the Iowa Prairie Online Seed Calculator (3) Applied research through the Restoration and Research Program headed by Dr. Justin Meissen and (4) Support for a "community of practice" that is bringing practitioners together to learn from one another, identify key barriers and challenges, and expand their technical capacity. The Prairies on Farms project is funded by the Iowa Nutrient Research Center, the Leopold Center for Sustainable Agriculture, and the Iowa Economic Development Authority - Iowa Watershed Approach. We are proud to collaborate with the Iowa State University STRIPs project, Practical Farmers of Iowa, People's Company, Hertz Farm Management, Pheasants Forever and Monarch Joint Venture. Pictures were taken at in-field prairie strip that was planted in 2015. Flowering image was taken in the second year of the planting. The Prairie on Farms project held its first Working Group meeting on April 21, 2016. 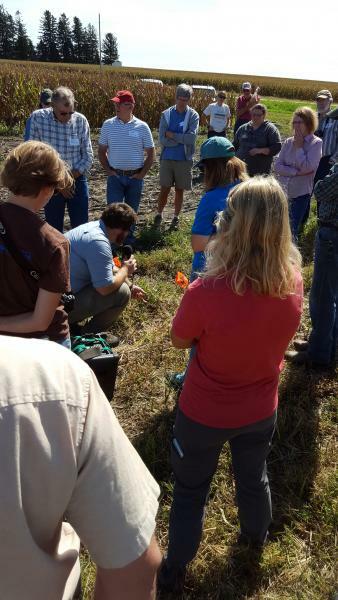 The goal of the meeting was to network with other professionals who value conservation practices for water quality and pollinator habitat purposes. 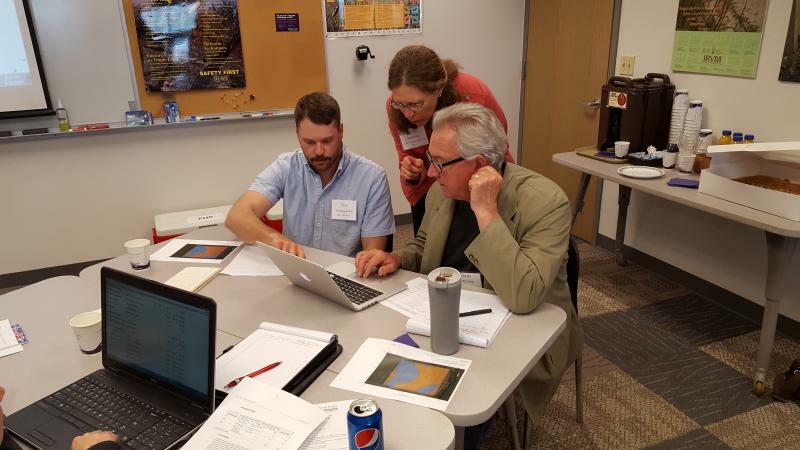 The working group discussed ways to strengthen conservation resource efforts that are facing the state and gained familiarity with the newly launched Iowa Prairie Seed Calculator. The Iowa Prairie Seed Calculator is a free tool that recommends a custom blend of grasses, sedges, legumes and other forbs specifically for your planting site. Users have complete control to add or subtract species and it provides an easy way to send the seed mix out for bid. Participants were walked through step by step how to use the calculator. A YouTube video of this tutorial is now available; watch the demonstration now! In addition to learning about the Iowa Prairie Seed Calculator, attendees shared thoughtful, provoking reflections on what challenges and opportunities they see in their own jobs. These reflections led to meaningful conversations which identified areas of overlap and ways we can work together for wildlife, pollinator and water quality conservation efforts. We hold an annual working group meeting in the winter. If you are a professional in the conservation, wildlife, pollinator, water quality improvement or technical services provider field and are interested in learning more about future working group meetings, please contact ashley.kittle@uni.edu. Prairie on Farms hosted demonstration field days on September 14th in Dysart, IA and September 16th in Nashua, IA. The workshops focused on practical uses of prairie for water quality improvement efforts and pollinator habitat, stand evaluation (comparison of an economy mix, diversity mix, and pollinator mix plantings, seedling ID, and how to determine if a planting was successful) and first and second year maintenance (weed control, and spot spraying techniques). 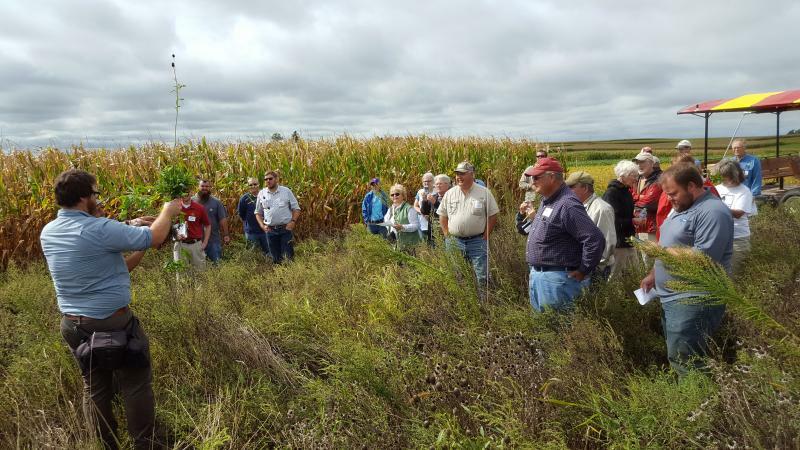 The demonstration sites and field days were sponsored by Leopold Center for Sustainable Agriculture, the New York Community Trust, Iowa Nutrient Research Center, and the Natural Resource Conservation Service. Approximately 70 participants attended the two workshops. For more information on upcoming meetings and educational opportunities, contact Ashley Kittle at ashley.kittle@uni.edu or call #319-273-3828. 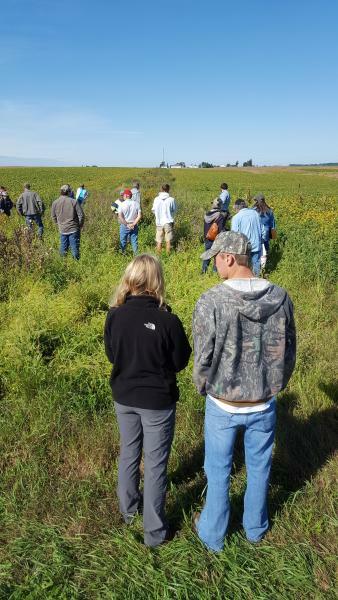 Participants learn and walk through an in-field prairie strip planted in Dysart. Dr. Justin Meissen identifies prairie seedlings in a recent prairie buffer strip planted in Dysart. The importance and benefits of first year mowing on prairie plantings are discussed.